SOF News Update 20181121 – Cost of the GWOT, peace deal in Afghanistan, U.S. Navy declines in Pacific, podcast – “Making of a Night Stalker”, Trump’s criticism of McRaven, OSS and the origins of SF, SA – pros and cons, Russian mercenaries, NATO’s Trident Juncture, Yemen fighting continues, Air Base 101, Green Beret faces murder charge, 35th CA Cmd CoC, Melgar murder probe, terrorism and criminal activity, SOF and VAS technologies, all about DLI, paper on exploiting data for SOF, and more. SOF News will be taking a short break from writing to enjoy the Thanksgiving Holiday. Back on Monday, November 26th. The staff here at SOF News would like to wish everyone a Happy Thanksgiving. For those international readers (probably 1/2 of the subscribers to the newsletter) Thanksgiving Day is one where the folks in the U.S. eat turkey, give thanks for the good stuff that has happened in the past year, and enjoy the company of family and friends. 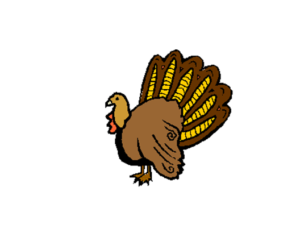 For those readers who are deployed (Soldiers, Sailors, Airmen, Marines, DoS, DEA, the occasional CIA agent, and others) we wish you a Happy Thanksgiving and hope you get your fair share of turkey! GB May be Charged with Murder. A Special Forces officer, Major Matthew Golsteyn, could be charged with the murder of a suspected Taliban bomb-maker. Seems he admitted during a polygraph test during a CIA job interview and on national TV to the murder. (Task & Purpose, Nov 19, 2018). Trump Criticism of McRaven Criticized. The Navy SEAL who shot OBL is pushing back on Trump’s remarks about the 2011 raid into Pakistan. (Business Insider, Nov 19, 2018). SOF and VAS Technologies. Special Operations candidates may soon need a course in computer technology during the Special Forces Qualification Course. The equipment used by SOF is becoming ever more complicated. Read “Special Operations Command Sees Potential in AR, VR for Soldiers”, Federal Tech Magazine, November 20, 2018. NZSOF Inquiry. An investigation is ongoing to look at claims that the New Zealand Special Air Service conducted raids that killed Afghan civilians. (National Stuff NZ, Nov 20, 2018). More on SEALs Charged with Murder of GB. Two Navy SEALs and two Marine Raiders will be facing a preliminary hearing on December 10th. They have been charged with the felony murder of SSG Logan Melgar, conspiracy, obstruction of justice, burglary, hazing, and involuntary manslaughter. (Special Operations.com, November 20, 2018). Marine Raiders Also Involved in Melgar Death. The two Marines present during the death of SSG Logan Melgar have been named. They face an Article 32 hearing along with the two SEALs named in Melgar’s death. (Marine Times, Nov 20, 2018). 350th CA Bde Cmd. The Pensacola, Florida based Civil Affairs brigade has a new commander. Read “350th Civil Affairs Command Welcomes New Commander”, DVIDS, November 17, 2018. Former Navy SEAL on Overcoming Adversity. Jason Redman provided his perspective to an audience at the DIA on how an “overcome” mindset helps him to defeat adversity. See “Retired Navy SEAL talks leadership, love and life after Iraq”, DIA DVIDS, November 19, 2018. SEAL Facing Charges of Murder Gets Help. Two high-ranking Iraqi officers have provided statements that would seem to exonerate Special Operations Chief Edward Gallagher. He is accused of killing a prisoner but it would appear there are cracks in the case. Read “NCIS documents cast doubt on Navy SEAL’s guilt in slaying of Islamic State fighter”, Navy Times, November 19, 2018. Paper – SOF and Exploitation of Data. Tammy Low has penned a 22-page paper entitled Exploitation of Big Data for Special Operations Forces. Published in November 2018 It is available on the Joint Special Operations University (JSOU) website. OSS and the Origins of SF. The U.S. Army Special Forces traces its origins from a number of previous military units and organizations. Many units from World War II had an impact on the organization of U.S. Army Special Forces in the early 1950s – to include the Rangers, First Special Service Force, Office of Strategic Services, Merrill’s Marauders, and more. There are some critics who maintain that the OSS Society is maintaining a distorted sense of history when it comes to the origins of SF – and the society is responding. Read a November 17, 2018 letter by the OSS Society to the commander of USSOCOM on this topic. Terrorism and Criminal Activity. Some terrorist groups turn to criminal operations to raise funds. Criminal organizations and insurgent groups share many similarities. Read “The Evolution of Insurgent Identities: Why Terrorist Groups Turn into Criminal Enterprises”, Georgetown Security Studies Review, November 19, 2018. Cost of GWOT. The results of the Global War on Terrorism has been mixed at best. There has not been an attack anywhere near the scale of 9/11 in the U.S. However the ideology that leads to terrorism seems to have grown significantly. The U.S. has spent trillions of dollars on the GWOT but there seems to be no endpoint to many of the conflicts we are engaged in. Read more in “The Staggering Cost of the Never-ending Global War on Terror”, TSC Intelbrief, November 19, 2018. U.S. Navy in the Pacific. A student of China and security in the Pacific – Robert Ross – writes about the decline of U.S. naval strength in the Asia region. Read “The End of U.S. Naval Dominance in Asia”, Lawfare, November 18, 2018. Article on Army IO Manual. In October 2018 the Army released a new manual entitled “The Conduct of Information Operations”. (Fifth Domain, Nov 19, 2018). Learn about DLI. The Defense Language Institute started up weeks before the beginning of World War II. Based in Monterey, California it now offers instruction in 17 different languages. Read more in “Defense Language Institute: Bridging Languages, Cultures”, Defense Media Activity – Navy, May 11, 2018. SA – Pros and Cons. Security Assistance or SFA has grown in importance over the past decade as an instrument of US policy. A recent roundtable was conducted where four prominent observers provided their perspective on SFA. Stephen Tankel, Andrew Boutton, Tommy Ross, and Melissa Dalton each write on this topic in “Policy Roundtable: The Pros and Cons of Security Assistance”, Texas National Security Review, November 20, 2018. Peace Deal Soon? Special Envoy Khalilzad said he is hoping to get a peace agreement with the Taliban prior to the April 2019 Afghan presidential election. He met with Taliban representatives in Qatar for three days last week. President Ghani is proposing the formation of a ‘Consultative Peace Council’ – which puts questions in the minds of some of what the continued role of the High Peace Council will be in the future. The U.S. appears to be focused on a political settlement to resolve the long-running conflict. The public stance of the U.S. is that the conflict will not be ended with a military victory be the Afghan government or the Taliban. TFSW Shuts Down Facebook Account. The Marines of Task Force Southwest has closed its Facebook account citing operational security concerns. (Marine Corps Times, Nov 20, 2018). DoG IG Report on Afghanistan. The Lead Inspector General for Operation Freedom’s Sentinel has submitted its quarterly report to Congress. The report covers July – September 2018. (DoD IG, Nov 19, 2018). Russian Mercenaries. A Russian veterans group has appealed to the International Criminal Court (ICC) to investigate the alleged mercenary activities of Russian private security firms. (Radio Free Europe, Nov 19, 2018). More on Trident Juncture. The huge NATO military exercise in Norway signals the alliance’s pivot from expeditionary warfare back to its original foe – Russia. Read more in “Preparing for the New Cold War”, Bloomberg, Nov 20, 2018). Yemen – Fighting Continues. A short article provides a brief history of the conflict in Yemen and current status of the fighting. (BBC, Nov 19, 2018). Kirkuk and U.S. Policy. Michael Knights, a specialist in military and security affairs of the Middle East, provides input for U.S. policymakers on Kurdish politics and U.S. national security interests. He looks at the Fall 2017 referendum on Kurdish independence and offers some key lessons learned. Read “The Kurdish Referendum and Kirkuk: Lessons for U.S. Policymakers”, The Washington Institute, November 19, 2018. Niger Drone Base. The future hub for armed drones and other aircraft being constructed in Niger will not be completed until the middle of 2019. Niger Air Base 201 – located in Agadez –construction is delayed due to rainy weather and a harsh environment. So currently there are no U.S. ISR operating out of the base. The drones are currently being flown out of Niamey – Niger’s capital. (Air Force Times, Nov 19, 2018). Kenya’s Coast Guard. The maritime security of Kenya used to depend on the Kenyan Navy. But now the Coast Guard is up and running – with its one boat to cover over 621 miles of coastline. (BBC News, Nov 19, 2018). Scramble for Africa. The Arab Gulf states are intervening more assertively in sub-Saharan Africa – looking to take advantage of economic opportunities and enhance their security posture. Getting involved in Africa also enhances their prestige on the international scene. However, there is a down side. Read The Gulf Scramble for Africa, by Will Todman, Center for Strategic and International Studies, November 2018. Podcast – Making a Night Stalker. The folks at Skillset Magazine interview with author and special operation veteran, David Burnett, and talk about his new book – Making a Night Stalker. A former crew chief with the 160th – Burnett talks about training, missions, getting out of the Army, and adjusting to civilian life. November 19, 2018, 30 minutes. Listen to the podcast here. 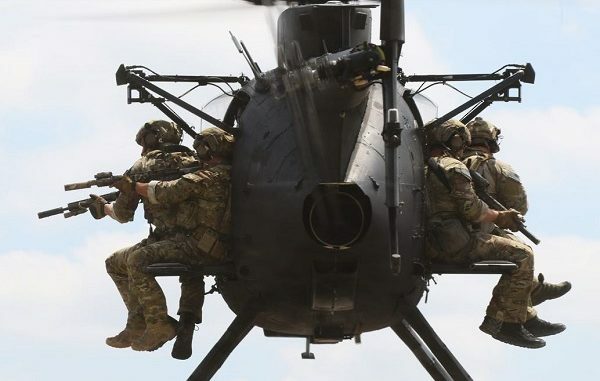 Photo: Rangers of the 1st Battalion 75th Ranger Regiment ride aboard a 160th Special Operations Air Regiment (SOAR) Little Bird helicopter. (USASOC photo).